Mind Games: How Optical Illusions Can Fool Your Brain! Take a close look at the picture below. How many different colors do you see? You might have said three: one shade of green, and two shades of red. Actually, there are only two colors: one shade of green, and one shade of red! If you find this hard to believe, look at the close-up picture below of where the two red lines cross. Why do these colors look so different in the first picture? This is an example of an optical illusion, an image in which the things you believe you see are different from what is actually there. 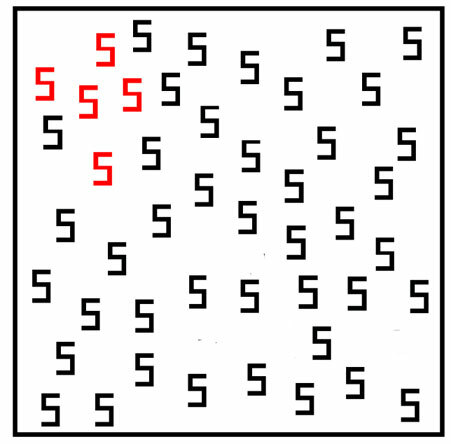 In the above case, this is a color and brightness illusion: the color of the red squares appears darker when they are surrounded by the green squares and lighter when they are surrounded by the white squares. Your perception of the shade of red is being affected by the surrounding color, creating the illusion that the two stripes are different shades. Optical illusions can usually be divided into four types: ambiguous illusions, distorting/geometrical illusions, paradox illusions, and fiction illusions. 1) An ambiguous illusion is one in which the picture may be viewed as one of two or more different images, depending on your perception. Often you may see both, as your brain switches between the two. For example, the duck-rabbit illusion below may be viewed as a duck, or a rabbit. Another good example of an ambiguous illusion is the Rubin Vase illusion, which may be viewed as a vase, or as two faces coming close together. 2) A distorting/geometric illusion is one which your perception of the length, size, or curvature of an object is not an accurate representation of reality. A wonderful example of this is the “Café Wall” illusion, as seen below. The horizontal lines appear slanted, but they are all parallel to each other! Another example is the Ponzo Illusion. 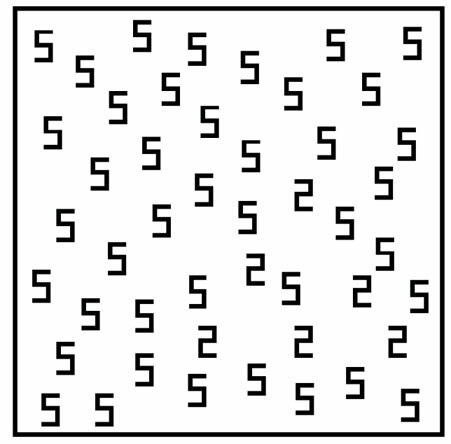 In this illusion, the parallel lines running from the top to the bottom of the picture appear to be converging on a point, telling the brain that the yellow line at the top of the image must be further away. If it is further away, it must be larger than the one at the bottom of the image, which appears closer. The reality however, is that both the yellow lines are the same size! 3) A paradox illusion is one in which the perceived picture is not possible in reality. The Penrose triangle is one example. Here it appears that a solid triangle is formed, but one side of the triangle appears to be going away from the viewer, and the other side angled towards the viewer, with the bottom perpendicular to view (i.e. not going toward or away from the viewer). In reality, making a solid triangle this way is physically impossible. The drawings of the artist M. C. Escher display many paradox illusions beautifully. To view some of his works, we recommend visiting the M.C. Escher Official Website, as well as the M.C. Escher page from Artsy.net. 4) A fictional illusion is when an image is perceived in a picture, even though that image is not really there. A good example is the Kanizsa Triangle, shown below. Why do our minds fool us this way? There are several explanations as to why optical illusions exist. First, perceptual organization: our minds are constantly trying to make sense of the world around us, and to do this they must organize incoming information into a meaningful whole. This is called Gestalt organization (ref). Gestalt organization can explain many illusions, including the Duck-Rabbit and the Rubin Vase illusions: our minds perceive the whole, but switch back and forth between the duck and the rabbit, or the vase and the faces. It can also explain the Kanizsa triangle, in which the mind perceives triangles by filling in lines within the empty space. A second explanation of optical illusion is depth and motion perception. In the Ponzo illusion, the lines at the top of the picture appear further away than they are at the bottom of the picture. If this is true, the yellow line at the top is further away, and thus must be larger than the one at the bottom. However, our minds forget that this picture is not really three-dimensional—it is only two dimensional. As such, the lines are really the same size. Third, as we discussed previously, the perception of color and brightness may make two objects that are the same color and shade appear to be two different shades, as in the red square example from before. 1. Optical illusion. Wikipedia. 2014, March 31. Retrieved 3-31-2014. (http://en.wikipedia.org/wiki/Optical_illusion). 3. Richard G. (1997) Knowledge in perception and illusion. Phil. Trans. R. Soc. Lond. B 352: 1121-1128. 4. Eagleman, D. M. (2001) Visual Illusions and Neurobiology. Nature Reviews Neuroscience. 2(12): 920-926. 5. Purves, D., Lotto, R.B., Nundy, S. (2002) Why We See What We Do. American Scientist 90(3): 236-242.